Livingston Woods Land: Livingston Woods; the last vestige of true estate lots in the heart of Naples. This unique opportunity offers a total of 10-acres of southern exposure land. Situated across from a beautiful equestrian retreat. Currently configured as a 5-acre piece boasting a charming two-story cottage with 3 bedrooms, 3 baths, a fireplace and stately Royal palms. Irrigation is in place and operational. The uncleared portion offers 5 acres to the West. This is a premier location with excellent proximity to the Community School and other private schools, as well as medical. The southern boundary of this estate backs up to state-owned land which will remain in developed. The possibilities for re-development for this special property are incredible! Livingston Woods Land: Builder special! Beyond your dreams yet within your reach, this is 2.5 acre estate living at its best only 15 minutes to Naples Beaches! This ESTATE LOT is west of I-75. Man has always developed the best parcels of land, hence Location, Location, Location. Come see why this property is in the BEST LOCATION in what is now Livingston Woods. Nested on Hunter's ROAD, arguably the nicest street with sprawling estate homes. Sited in Livingston Woods this 2.5 acres of selectively wooded acres with pines and palmettos, is ready for YOUR sprawling estate home. One of only a few lots that remain in Livingston Woods. Almost ¾ of a mile from I-75 and ¼ mile from Livingston Road and this makes for quiet enjoyment. Attention INVESTORS, and custom home BUILDERS, Pine Ridge vs. Livingston Woods offers 2.5 ACRES of land at a great value. See the Florida Department of Environmental Protection letter and the site plan in the pictures. SELLER FINANCING available. You build the home, seller will partner and split the profits. Call for details. Livingston Woods Land: Rarely Available Cleared, 2.5 Acre, Square, Corner Livingston Woods Lot. 30,000 in impact fees have been paid, well on site, fill in place. Ready to build your dream home. Livingston Woods Land: Build your dream home on this unique flag lot! There is not much land left this close in and in AAA school district, conveniently located close to beaches, shopping, dining and more. Over one acre in Livingston Woods in the middle of Bottlebrush. Very quiet and peaceful lot, it sits behind 6581 Bottlebrush. This lot has been subdivided and is the back parcel with a 75 ft width for driveway to back of the property. There is a path to the back of the lot but it is a little overgrown. Owner says sell! 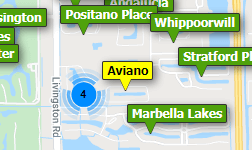 Need professional assistance selling your property at Livingston Woods Naples? Find out how an Area Specialist can help to generate more property exposure in order to get the most money for your investment in the least amount of time.